Nicola Adams turning gold into pros? 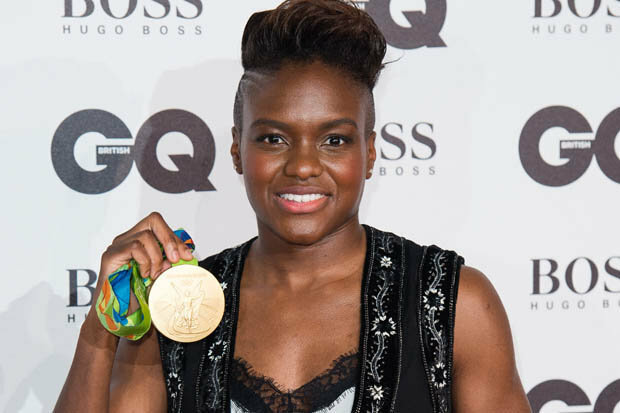 EDDIE HEARN is trying to sign Olympic star Nicola Adams. TheMatchroom chief wants to put the two-time gold medallist on the undercard of Anthony Joshua’s IBF heavyweight title defence in Manchester on November 26.Adams, 33, has yet to make a decision on her future after winning her second flyweight gold in Rio this summer.The Leeds fighter could stay on with GB Boxing and go for gold in Tokyo, and Hearn initially said she should go to the next Olympics. But he now wants talks with her after seeing the reaction she got from the crowd at the recent GQ awards in London. The promoter said: “We will probably have a meeting this week. “I was at the GQ Awards when Anthony Joshua got sportsman of the year. She presented the award and I could not believe the reception she got.“It was as ifthe whole place were on their feet. I looked around as a promoter and thought ’eh?’.“I’ve known Nicola a long time, I really like her. She has such a great smile, a great personality. I’ve never really looked at women’s boxing, but if it is going to work, it is going to work with her. “In the past, I don’t think there has been any interest from broadcasters in women’s boxing, now I think the landscape has changed a little bit. Women’s professional boxing is nowhere near as lucrative as the men’s side of the sport.But Hearn believes he can make Adams a professional star and is eyeing up a world title within four fights for the talented puncher.“I want to find out what she wants to do,” he said. “I’m sure we can get her a world title fight. “We are struggling keeping our own contracted fighters active, so if we sign anyone else, it has to be the right ones. “With Nicola, a lot of people will be interested in the debut. The couple after that might be a tougher sell. “Then look at a headline in Leeds for a world title fight. “When you see some of the women’s amateur boxing, some of it is quite poor. She would have to face quality fighters, I’m sure she wants to. “The first fight is going to live in the memory. If it’s poor, it’s going to kill you. If it is a good fight, she looks great, people will think it’s good. “People know who she is, but to see her in the pro ranks is something different, some people won’t know what to think. “If it goes well on the Joshua card, it can really get momentum.“Can she headline her own show for a world title? Only three or four fights can tell you. If it doesn’t then itcan be an undercard.“I thought about putting her on a card before as an amateur, speaking to GB Boxing and just doing it as a showcase bout.